My annual November wine trip to the Sierra Foothills has become a tradition. This year, my friends and I made the trip on the weekend before Thanksgiving instead of the holiday weekend itself. And we were back to a small group this year – just my friends Jane and Alan came along – rather than the larger crowd (nine of us!) last year. The three of us met up in Berkeley, and from there we hit the road on a cool but clear Saturday morning. We were making great time until we were delayed by a road-striping crew along two-lane Highway 16 east of Sacramento. We moved at what seemed a snail’s pace until the crew finally pulled off the road and let the long line of cars past. We were starting with a couple of visits in Amador County wine country this year, with our first destination at Shake Ridge Ranch near the old mining town of Sutter Creek. Shake Ridge’s Ann Kraemer had encouraged us to stop along the way at Andrae's Bakery in tiny Amador City, just north of Sutter Creek. I’d never been to the bakery before, and we were all amazed at the big crowd lined up to buy bread, pastries, and coffee there – it’s a popular spot, and as we found later when we dug into the goodies we’d picked up there, deservedly so! Yorba 2009 Barbera, Shake Ridge Vineyards, Amador County. Medium color, featuring bright cherry and plum fruit with hints of earth, flowers, smoke, and spice. Medium-bodied with juicy acidity but fairly mild tannins, very nice. Yorba 2008 Zinfandel, Shake Ridge Vineyards, Amador County. About 20% Petite Sirah. Medium color, this had intense boysenberry and raspberry aromas plus earth, flowers, and a touch of black pepper. Medium weight on the palate with a lively texture and firm but refined tannins, nice. Yorba 2008 Syrah, Shake Ridge Vineyards, Amador County. Medium-dark color, with tobacco and dried herb scents upfront, along with dark fruit, baking spice, and a floral note. Bright acidity with moderate tannins and a lingering finish. Yorba 2008 Tempranillo, Shake Ridge Vineyards, Amador County. Co-fermented with 8% Graciano. Medium-dark color, showing tobacco, ripe plum, smoke, and earth on the nose. Medium-full bodied with moderate acidity and fairly big, chewy tannins on the finish. Yorba 2008 “Shake Ridge Red,” Shake Ridge Vineyards, Amador County. 33% Petite Sirah,16% Syrah, 13% Grenache, 11% Mourvèdre, 9% Graciano, 8% Cabernet Franc, 6% Malbec, 4% Merlot. Medium-dark color, this displayed aromas of black cherry and raspberry, earth, and exotic spices. Richer texture than the previous wines, with great structure and big but refined tannins, nice. After our stop in Amador City, we followed Ann Kraemer’s excellent directions to Shake Ridge Ranch, a few miles east of Sutter Creek in Amador County along Shake Ridge Road. Naming a road for California’s earthquakes? No, it’s actually named for an old cedar shake roofing business. Pulling up next to a large barn on a knoll overlooking part of the vineyard, Jane, Alan, and I got out of the car and quickly found Ann, who was helping her father and brother-in-law to roll up bird netting for the year. She welcomed us, and asked right away if we would like to hop on her ATV for a tour of the vineyard – that was an easy decision for us! There wasn’t room for all of us on the seat, but Alan volunteered to stand in the back – a bit less comfortable but with a more panoramic view. Ann has a long history growing some of Napa Valley’s finest winegrapes, but she didn’t start out studying viticulture when she first attended UC Davis – instead she earned a degree there in the broader field of pomology. Her family, which traces its history in California to Jose Antonio Yorba, a member of the Spanish Portola Expedition of 1769, have been longtime citrus growers in Southern California, where much of her family still lives. After college, Ann worked in Guatamala to help set up an orchard before returning to work with her father’s orange groves, but she decided that she didn’t want to do that in the long term so she went back to UC Davis to study viticulture. After an internship at Sterling, she started in 1986 at Swanson Vineyards as their first vineyard manager. Over the years, she managed vineyards there and at Domaine Chandon as well as consulting on viticulture for wineries including Cain, Calera, Paul Hobbs and Shafer. Ann had wanted her own vineyard for many years, and had looked at a number of properties but decided against them. She ultimately focused on the Sierra Foothills, where she told us that the price in relation to the quality of land provided her with the best opportunity to find a suitable site. After finding the time to look at about 40 properties in four days, she finally located the spot she wanted. From the start, Shake Ridge Ranch has been a family operation. The key to purchasing the property in 2001 was her father arranging a trade for some of his Southern California land, and the Kraemer family pooled money to buy vineyard equipment and to plant the vines. Ann’s family continues to be integral to running the operation. As mentioned, her father and brother-in-law were working at the ranch on the day of our visit, and Ann told us that they like to always have a family member at their new Yorba Wines tasting room in Sutter Creek, opened earlier in 2013. In addition to supplying grapes for the Kraemer family’s own Yorba label, Shake Ridge Ranch currently sells fruit to about 20 other producers. Ann’s reputation for growing top-notch fruit has attracted some highly-regarded buyers, a number of them from Napa. They include both established and up-and-coming wineries such as Favia, Keplinger, Tribute to Grace, Turley, JC Cellars, Forlorn Hope, and Dirty and Rowdy. Sierra Foothills wineries are also purchasing fruit – Bella Grace, Hatcher, and Newsome-Harlow are among these producers. 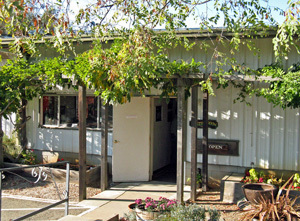 Favia Wines was the first buyer of Shake Ridge’s fruit, starting with the vineyard’s first commercial vintage in 2005. 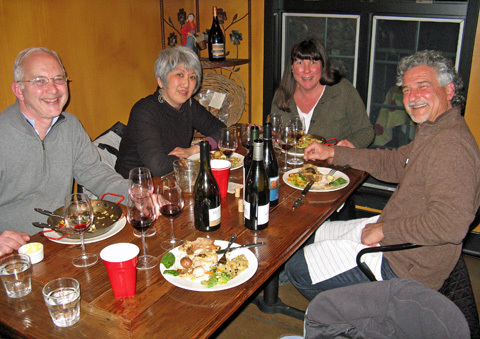 A superstar partnership of Annie Favia (she’s worked with John Kongsgaard, Cathy Corison, and David Abreu) and her husband Andy Erickson (he’s famed for his wines from Screaming Eagle, Dalla Valle, Ovid, Arietta, and others), Favia’s wines helped attract attention to Shake Ridge. 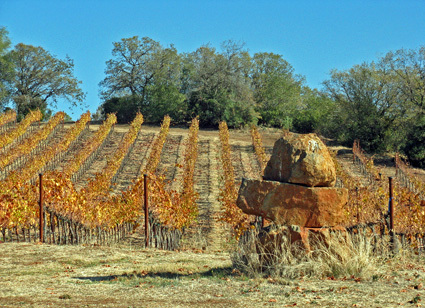 Since Amador County has not always been associated with high-quality winegrapes, it was not a given that Shake Ridge would develop the high reputation that it now has. It’s been said that Ann Kraemer is farming her Sierra Foothills vines using “Napa Valley viticulture” – a tribute to her using the time- and labor-intensive techniques she learned growing some of Napa’s top grapes to get the most from her own vineyard. 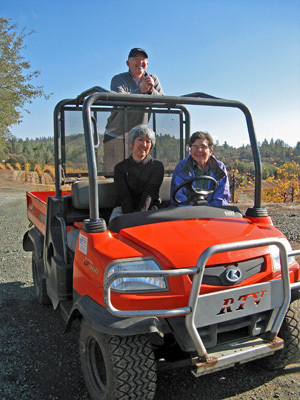 As Ann gave us an exhilarating ATV ride through the vineyard, she talked with us in great detail about the soil, climate, and the vines. The 216-acre property had previously been a cattle ranch so it had been cleared before Ann and her family bought it in 2001. Site preparation began the following year, and 34 acres were planted in 2003, with an additional 12 acres planted in 2009. There are 12 grape varieties currently on the ranch – Zinfandel and Primativo take up about 26% of the vineyard acreage, while red Rhône varieties Syrah, Grenache, and Mourvèdre account for 37%. Barbera, Tempranillo, and Petite Sirah are each from 8 to 12% of the total, and there are smaller plantings of Viognier, Graciano, Malbec, and Greco di Tufo. The original vineyard plantings had included Cabernet Sauvignon, Cabernet Franc, and Merlot, but Ann felt the growing season was too warm and too short for them, and the wines were not on a level she was happy with. These three varieties have been grafted over to others, leaving Malbec, the only remaining Bordeaux variety, for use in blends – though Ann didn’t rule out making a varietal Malbec someday. The rolling hills of the vineyard site, at elevations ranging from about 1,650 to 1,800 feet, afford many different slopes and aspects, so that each grape variety was planted in the most suitable spots with appropriate rootstock and trellising. Syrah is planted mostly on east-facing slopes in cooler spots, while Mourvèdre is on warmer west-facing slopes, Tempranillo is on north slopes, and Petite Sirah in lower areas with deeper and richer soil. Ann wisely avoided the lowest spots to avoid potential frost damage – the vineyard does not have any frost protection but due to the way it is planted there has been very little trouble with frost. Soils at Shake Ridge tend to be rocky, deep, and well-drained. Ann said the soil base is mostly metamorphic, with volcanic soil above. Much of that soil is from decomposed basalt, with low nutrient levels. Rocks include quartz, black shale, and soapstone – we saw plenty of quartz in particular and also shale as we toured the vineyard. With Amador’s reputation as a warmer-climate growing area, Ann told us that she was surprised that the site is as cool overall as it is, as wind is channeled through gaps in hills. She said that it’s not unusual to have a 40-50 degree diurnal swing during growing season. Ann pointed out a sign of her site’s cooler location – the large pines and other evergreens that are around the vineyard are mostly seen at cooler, higher-elevation sites such as in El Dorado County rather than in most of Amador wine country. She had been unsure initially about planting Viognier at Shake Ridge – it’s planted in the vineyard’s coolest spots – but it’s done so well there that more Viognier was added in 2009. Most vines at Shake Ridge are on trellises but some are head-trained. About half of the Zinfandel is head-trained, as are some Tempranillo and Grenache. Ann noted that the trellised Zin vines tend to have slightly higher yields. So far, she’s found that head-trained Tempranillo has been difficult to work with but she thinks it will ultimately work out. Ann’s been happy with the head-trained Grenache since the canopy shades the fruit well – she said Grenache will lose both color and aromatics with too much sun, although it likes heat. She told us that Grenache is the “smartest variety” since the vines manage their use of water very well; on the other hand, Syrah is “stupid” – the vines tend to have little control over their own growth, so they will not thrive when they have limited water. When possible, Ann prefers trellised vine rows oriented northeast-southwest – this relationship with the solar path helps keep sugars in check while making it easier to keep the fruit from getting burned. But rolling through the vineyard on the ATV, it was clear that the direction of the various hillside slopes dictated row orientation in many areas. Ann prunes the vines later than many growers in the area, and allows for extra buds that can be removed later to control vine growth. Vines are irrigated around the time of veraison for most areas, typically with one or two deep irrigations per season. Cover crops are currently grown in every other vine row, and compost mix and gypsum are about the only things added to the soil. Farming is mostly organic except as needed for some weed control and rodent control. Ann mentioned the difficulty of dealing with birds – there were problems with bird damage to the fruit in the early years of the vineyard. She told us of the numerous methods she’d tried for keeping birds away from the grapes, but nothing worked until she gave in and started netting the vines at the start of veraison. It’s an expensive and labor-intensive solution, but Ann found it to be the only thing that worked at Shake Ridge. It was fascinating to drive through the vineyard at this time of year, following harvest. The many varieties and blocks of vines displayed lots of differently colored canopies, with some blocks already completely bare of leaves. We drove by a block full of intensely red-colored leaves – a sign of leafroll virus. Ann told us these were Zinfandel vines sourced from the famed Monte Rosso Vineyard in Sonoma, and unfortunately the virus is so widespread that she’ll have to replant most of that block. She’s also had to replant some Syrah due to the still-mysterious “Syrah Decline” that affects some of that variety. At Shake Ridge, the 174 clone Syrah had considerable Syrah Decline problems but the 470 clone has done well. We stopped at one of the lower spots in the vineyard, where Ann pointed out a small block of head-trained Greco di Tufo – a variety not seen much in California. She likes bright, edgy whites and thought it would work there, although she’s not sure yet that the site is warm enough. Before planting the Greco, she’d also considered Fiano – both varieties hail from Campania in southern Italy. Looking at (and riding up and down) some of the vineyard’s hillsides, I asked Ann whether she’d ever considered terracing some of the steeper portions. 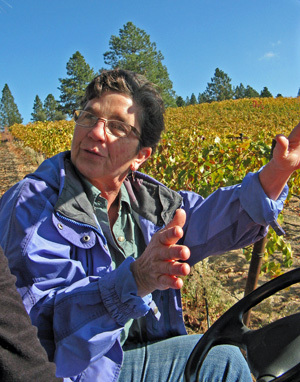 She replied that she doesn’t like terracing vineyards – not only is it expensive, but safety and soil stability can become more of an issue than with planting on the hillside slopes. Ann doesn’t like the uneven soil conditions that often occur from the front to back of terraces – she told us she prefers to keep the soil where it is. As Ann drove the ATV back up to the vineyard barn, I asked her what makes her farming different from what most others do in the area. She said the main difference is making more thinning passes, and generally doing more time-consuming and detailed work in the vineyards than many local growers. This attention to detail is based on her experience growing top-quality grapes in Napa, and clearly that has been recognized by the many buyers of Shake Ridge’s fruit. We walked to the back of the barn and sat down at a table under an arbor, with a beautiful view overlooking part of the vineyard, where Ann brought out bottles of the five current-release Yorba wines for us to taste. Although she was fighting a cold that took a toll on her voice the day of our visit, she’d managed to do a great job of talking about the vineyard, and now she proceeded to tell us about the Yorba wines. Yorba takes around 20% of the fruit from Shake Ridge, with annual production in the range of 1,800-2,000 cases. 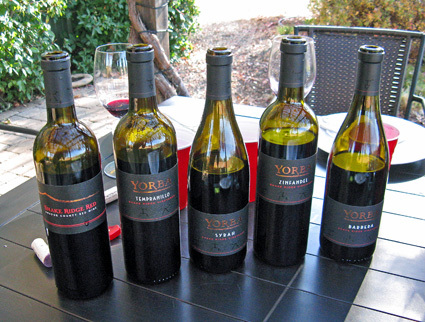 The first vintage for Yorba was in 2005, though Ann considers 2007 to have been the first “full” vintage. Ken Bernards (of Ancien Wines) makes the Yorba wines at his facility in Napa. Ann still does vineyard work for Ken – with so much of her time taken up with her own vineyard, he’s now her only client. She likes the idea of using a Pinot winemaker such as Ken for the Yorba wines, giving them a lighter touch. The wines are generally barrel-aged for less than a year but they get longer bottle age before release. Ann thinks that the early Yorba wines were released too soon and didn’t show as well as they could have when young, needing more time to develop in bottle. She told us that her rule of thumb is that once a bottle is opened, every hour before it starts to show its best is equivalent to aging the wine in bottle for the same number of months prior to release. She finds they typically need about three years in bottle to start showing their best. The Yorba labels display cattle brands from the family’s early- and mid-19th Century ranching days. We tasted four varietal wines plus one blend. Barbera was first up, and Ann told us that it’s always aged in one new barrel with the rest of the barrels being 2-3 years old. The Barbera showed me once again that this variety is beautifully-suited to Amador County. The Zinfandel is from selections obtained from Ridge Vineyards, and aged entirely in French oak, about 25% of it new. This was definitely not the sort of ripe, jammy Zin that most people associate with Amador County – it was not shy, but had far more elegance and nuance than most from the area. Next was Syrah, from 174, 470, and Noir clones plus Phelps selection. Another surprise in the glass, it showed more cool-climate character than I would have expected for a Syrah from Amador. We moved on to Tempranillo – this is usually co-fermented with 3-4% Graciano, but the 2008 has 8%. Ann said the Graciano adds acidity since Tempranillo on its own can lack enough. The final wine was the “Shake Ridge Red” blend – the varietal composition for this changes from year to year. The first “Shake Ridge Red” was made from leftover barrels but has since developed into a wine that is meant to showcase the best of the vineyard in each vintage. The current 2008 vintage includes eight grape varieties (including the last of the vineyard’s Merlot and Cabernet Franc). Ann told us that the 2009 will have a considerable Zin component, while 2010 will be around 50% Petite Sirah and 25% each Graciano and Malbec. Before our visit, Ann had asked us whether we’d have time for lunch at the vineyard before we headed to our next appointment, and we took her up on that. 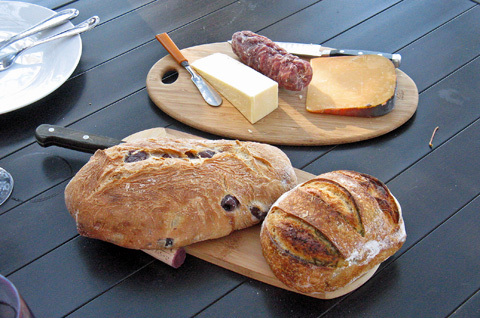 Ann brought out cheese, salumi, and olives to go with the breads and cookies we’d picked up that morning at Andrae's Bakery. We had a relaxing lunch, and it was a good opportunity to try some of the Yorba wines with food as well as on their own. We had a wonderful time visiting Ann at Shake Ridge Ranch. She was a charming host, and the vineyard tour with her was one of the most fun and educational ones I can recall. Her intimate knowledge of her vineyard and the detailed attention with which she farms it were obvious during our visit. She had joked with us that she would never have advised anyone to plant so many grape varieties with different clones, rootstocks, and trellising systems but that she somehow couldn’t resist doing it with her own vineyard. Of course farming a vineyard such as this takes extra commitment, and the work that Ann does on her vines goes beyond what many local growers do. The results are clear in the wines from the vineyard’s fruit. In the wines sourced from Shake Ridge that I’ve tasted from various producers, the quality of the fruit shines through although each winemaker has a different take on it. The Yorba wines that Ann and Ken produced were unlike most I’ve tried from Amador – ripeness and oak were well in balance, there was plenty of acidity, and each of the wines showed fine character and distinctiveness. They were all good, but my favorites were the Barbera, Zinfandel, and “Shake Ridge Red” blend. Shake Ridge Ranch has developed a deserved reputation for excellence in the Sierra Foothills, and the Yorba wines are a fine showcase for the vineyard and for Ann’s farming. Amador Foothill 2009 Semillon, Shenandoah Valley. Very light color, with melon and citrus aromas and a touch of spice. Medium-bodied, this had a fairly smooth texture and finish. Amador Foothill 2012 Sauvignon Blanc, Shenandoah Valley. 25% Semillon, made entirely in stainless steel. Light straw color, this featured lemon scents plus grapefruit and fresh herb notes. A medium weight Sauv Blanc with a lively texture and clean finish, nice. Amador Foothill 2012 Rosato – Dry Rosé of Sangiovese, Amador County. About 0.3% residual sugar. Light pink color, with watermelon, herb, and earth on the nose. Medium-light bodied, with a slight bite of tannin on the finish. Amador Foothill 2011 Grenache, Shenandoah Valley. 86% Grenache, 9% Mourvèdre, 5% Syrah. Medium-light color, this had bright and upfront strawberry aromas plus touches of spice and earth. Fairly light on the palate, with mild tannins. Amador Foothill 2009 Sangiovese, Shenandoah Valley. Medium-light color, displaying bright cherry, earth, and a chalky mineral note. Balancing medium body and fine acidity, this had moderate tannins on the long finish, nice. Amador Foothill 2011 Zinfandel, Clockspring Vineyard, Shenandoah Valley. Medium purple color, with lots of upfront boysenberry and plum fruit along with touches of spice. Medium weight with a tangy finish and mild tannins, this should be good for early drinking. Amador Foothill 2009 Zinfandel, Esola Vineyard, Shenandoah Valley. Medium color, with riper plummy fruit and a bigger spice component than the Clockspring bottling. A bit bigger on the palate, with firmer tannins on the finish, this should benefit from more bottle age. Amador Foothill 2009 Aglianico, Shenandoah Valley. Medium-dark color, featuring dark berry fruit and earth, plus tobacco/dried herb and a stony mineral note. Fuller-bodied with lively acidity and big, grippy tannins, this shows promise but will need more time in the cellar to show its best. Amador Foothill 2008 Late Harvest Semillon, Shenandoah Valley. About 7% residual sugar. Light color, this had melon and peach aromas plus a slightly chalky, earthy note. Medium-light weight with moderate sweetness, and a fairly long finish. After lunch, we drove back north from Sutter Creek, leaving Highway 49 at Plymouth and heading east into Amador County’s best-known wine region, Shenandoah Valley. We soon arrived at Amador Foothill Winery, where we were greeted in front of the tasting room by the husband-and-wife team of Ben Zeitman and Katie Quinn. It had been quite a few years since I’d visited Amador Foothill, but I’d enjoyed a couple of their wines at a Sierra Foothills wine tasting in 2010, and I’d spoken more recently with Ben and Katie’s new assistant winemaker, Eric Buffington (who also has his own Amelle label for Pinot). So I thought this would be a good opportunity to taste these wines again. Ben told us that he had worked in the Bay Area for NASA, and had been making wine at his home in Palo Alto for 12 years before making the transition to becoming a commercial winemaker. Ben said that he was a fan of the Zinfandels from Shenandoah Valley’s Eschen (now Rinaldi) and Esola vineyards, and this influenced his search for a vineyard site. He first planted the 20-acre estate vineyard and established Amador Foothill Winery in 1980, becoming one of the earlier modern-day producers in the area. Ben met Katie in 1985, while she was working at Gundlach Bundschu Winery in Sonoma. Both Ben and Katie have degrees in chemistry, and Katie went back to school at UC Davis to earn a masters degree in winemaking. The vineyard site is at about 1,700-foot elevation, with mostly decomposed granite soil that has good water retention, so only minimal irrigation is needed. In fact, the original Semillon vines planted in 1980 have been entirely dry-farmed for several years. Besides that Semillon, the original plantings included Sauvignon Blanc and Cabernet Sauvignon. That early Cabernet planting didn’t do well, and the vines were grafted to Sangiovese. In turn, Ben and Katie took out two acres of the grafted Sangiovese and planted Aglianico in 2003 – one of the few places that southern Italian variety is grown in California. 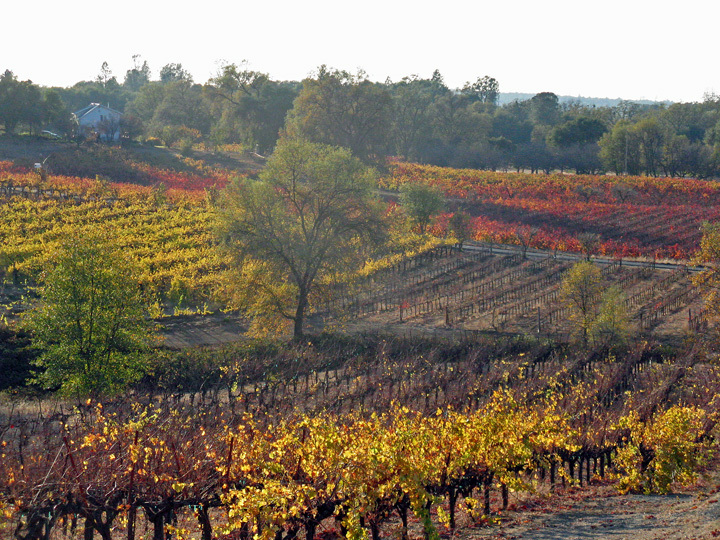 The vineyard also includes Grenache and Syrah that were planted on an additional 11-acre parcel that was purchased in 1999. The most recent vineyard plantings are Barbera and Mourvèdre that were added in 2009. Ben and Katie told us that they prefer “European-style” wines to most wines from California, and that they gear their own winemaking toward that style. They’ve reduced their annual production from a high of nearly 10,000 cases to around 3,500 cases now, which better allows them to control the quality. Unusual for a winery as small as theirs, they have their own bottling line, which enables them to bottle whenever they need to and whatever quantity is needed. 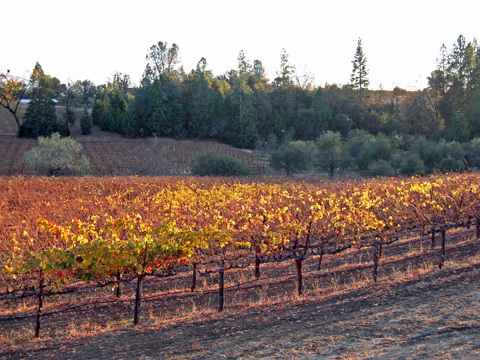 Over the years, Amador Foothill has produced a number of different wines. Ben and Katie mentioned that they had once made a White Zinfandel with about 0.8% residual sugar – it sold well but it was not really the type of wine they wanted to make, so it was discontinued. They’re probably best-known for three types of wine – their Sauvignon Blanc and Semillon, their Italian varieties, and their Zinfandels. 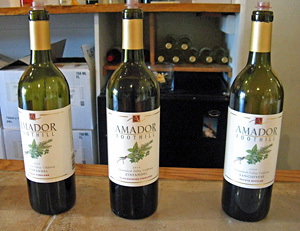 We headed into the tasting room to try the current line-up of Amador Foothill releases. We started with the Semillon and then moved to the Sauvignon Blanc. Katie told us that they still sell some Semillon grapes to home winemakers (some of whom have produced a sparkling Semillon from their fruit). The Sauvignon Blanc is typically the first fruit harvested each year, usually picked in late August. The 2012 Sauvignon Blanc that we tasted included 25% Semillon. Katie said that they used to make this wine in barrel and incorporated lees-stirring into the winemaking regimen, but now it’s made entirely in stainless steel. She also told us that they co-fermented their Sauvignon Blanc and Semillon in 2013, as both varieties ripened at the same time. This gave them the opportunity to combine the two early on rather than to blend them later in the winemaking process. We moved on to the Rosato, made from Sangiovese grapes. The fruit is picked and fermented specifically for the Rosato, and is not from saignée – about half is destemmed and then pressed immediately and half is left on the skins for a few hours to pick up some color before pressing. We continued with the reds, and Katie told us that most of them spend about 12 months in oak – typically only around 5% of this is new, while some wines such as their Barbera see no new oak at all. Ben and Katie use all American oak for aging their Zinfandels, and they prefer barrels from Italian cooper Gamba on their Sangiovese and Aglianico. They also age some reds in food-grade polyethylene tanks, a small but growing trend – the tanks are completely neutral vessels yet “breathe” in a similar way to oak barrels. The 2011 Grenache that we tasted includes some of the first Mourvèdre harvested from the estate vineyard. The Sangiovese comes from an older section of the vineyard, from about 50% each Brunello and Chianti Classico clones. Their Aglianico, from younger vines, needs more time in the cellar but holds promise. Despite their love for Zinfandel helping to lead them to Shenandoah Valley, Ben and Katie have never grown that variety at their vineyard. 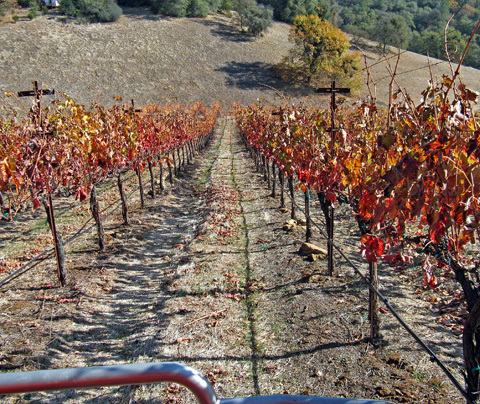 The availability of Zinfandel fruit already in the area – particularly from older vines – led to the decision to purchase their Zin fruit rather than grow it themselves. They currently source Zinfandel from two nearby vineyards. Clockspring Vineyard is just down the road from the winery – the wine from there comes from 35-year old vines and was the lighter of the two Zinfandels we tasted. Esola Vineyard was first planted about 100 years ago, with the fruit for the Amador Foothill Zin coming from dry-farmed vines planted in the mid-1940s. Sadly, vineyard owner Lena Esola passed away in 2013 though her daughter Denise continues to manage the vineyard. In honor of Lena, Amador Foothill held a vertical tasting of their Esola Zinfandels shortly after I visited there, but unfortunately I wasn’t able to make it to that event. The Esola Zin is barrel-aged longer than the Clockspring bottling, and needs more bottle age to show its best. We finished our tasting with a late harvest Semillon. Picked at about 33-34 brix, this was whole-cluster pressed and fermented with native yeast. Ben and Katie were great hosts, though we were a bit pressed for time the day of our visit – it will be worth returning in the future. While I thought the wines were a bit uneven going through the line-up (larger tasting glasses would have helped to evaluate them better), the best of them were certainly good. The Sauvignon Blanc and Sangiovese were my favorites of their current wines, and the Clockspring Zinfandel is a good choice for a young Amador Zin that’s ready to drink now. The Esola Zin and Aglianico need time but show potential. Amador Foothill Winery is making some wines that are not in the big, ripe style often found in Shenandoah Valley – they represent a nice change of pace and are worth checking out. Cedarville 2012 Viognier, Estate, El Dorado. 100% Viognier. Very light straw color, this displayed citrus aromas along with stony mineral notes and a touch of oak. Medium-bodied with fairly bright acidity, and a long, clean finish, nice. Cedarville 2011 Grenache, Estate, El Dorado. Includes 18% Syrah, 9% of which was co-fermented with the Grenache. Light garnet color, with bright aromatics that featured spice and mineral notes upfront, followed by red cherry fruit. Medium-light weight in the mouth with a lively texture, this finished with moderate, chalky tannins – pleasant now, but this should benefit from more bottle age. Cedarville 2011 Zinfandel, Estate, El Dorado. Blended with 6% Petite Sirah. Medium-light purple, with intense raspberry, strawberry, and spice on the nose, along with touches of vanilla/oak and earth. A middleweight Zin with bright acidity and medium tannins on the finish, nice. Cedarville 2011 Syrah, Estate, El Dorado. Includes about 2% co-fermented Viognier. Medium-dark color, this showed meaty/gamey aromas upfront, followed by raspberry and black cherry and hints of pepper and mocha. Medium-bodied and lively on the palate, with big, chewy tannins that will need some time to settle down – should be worth the wait, though. Cedarville 2008 Petite Sirah, El Dorado. Blended with 5% Cabernet Sauvignon. Dark color, this displayed black fruits and black pepper, with notes of chocolate, spice, and flowers. Fairly rich mouthfeel, with a grippy tannic finish. Cedarville 2010 Cabernet Sauvignon, Estate, El Dorado. 100% Cabernet Sauvignon. Dark purple, featuring dried herbs, ripe plummy fruit, spice, and sweet oak. Big and structured, finishing with a firm tannic grip. Cedarville 2010 “Turnabout’s Fair Play,” Estate, El Dorado. 45% Grenache, 30% Syrah, 25% Cabernet Sauvignon. Medium-dark color, with a darker fruit profile, plus tobacco/dried herb, baking spice, and stony mineral undertones. Medium weight on the palate with bright acidity and firm but refined tannins on the long finish, nice. Often the last stop of our annual Sierra Foothills wine tour is at Cedarville Vineyard, in the Fair Play AVA of southern El Dorado County, and we finished our day there again on this occasion. Jane, Alan, and I arrived at the winery just as another group of visitors was leaving – perfect timing! Jonathan Lachs and Susan Marks, the husband-and-wife owner / winemaker team, welcomed us in, although I dashed back outside to take a few quick photos before the late-afternoon light faded. 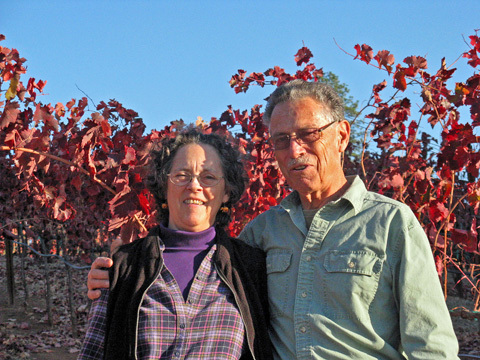 Jonathan and Susan both earned degrees in enology at UC Davis. After finding their vineyard site in 1995 and planting it that same year, their first commercial release was from the 1998 vintage. In 2000, they completed their winery, which is cleverly sited so that it’s partially sunken into a hillside to remain cool even during the summer months in the Sierra Foothills – though at around 2,500-foot elevation, those hot days are tempered by cool evenings. Jonathan and Susan farm their 15-acre vineyard organically, and it includes Viognier, Grenache, Mourvèdre, Syrah, Zinfandel, and Cabernet Sauvignon, all planted in the decomposed granite soil that’s found throughout much of the region. The only non-estate-grown fruit they use in their wines is Petite Sirah from nearby Naylor Vineyard. 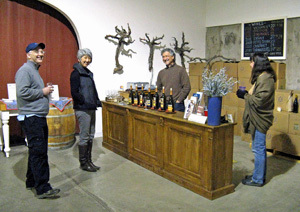 Jonathan and Susan also sell some of their fruit to other wineries, such as La Clarine Farm. They told us that they are selling more of their fruit than in the past, and lowering their annual production a bit. We all gathered at the small tasting counter inside the winery, where Jonathan and Susan poured us samples of their current wines. We began with the 2012 Viognier, which struck a nice middle ground between the leaner 2011 and bolder renditions from some other years – a good balance. Next were three reds from the 2011 vintage, the Grenache, Zinfandel, and Syrah. In general, Cedarville’s 2011 releases reflect the cooler growing conditions that year, with a somewhat leaner character than in many past vintages. Overall, the mineral component that I’ve often found in Cedarville’s wines seemed more pronounced in the 2011 wines that we tasted, and like many wines I’ve tried from that vintage, they display plenty of potential but will need more time in the cellar to show their best. The only wine we tasted that wasn’t a current release was the Petite Sirah – with the unusually cold growing season in 2011, that fruit did not get ripe so they were unable to make any that year and they poured a 2008 instead. Following this was the 2010 Cabernet Sauvignon, a tasty but youthful wine that will benefit from some bottle aging. Last but not least was the latest addition to the Cedarville line-up – “Turnabout's Fair Play,” inspired by the wines of Priorat. This was an attractive and intriguing blend, though due to its tiny production, it’s already sold out at the winery. I always enjoy visiting Jonathan and Susan at Cedarville – they’re terrific hosts and their wines have consistently been some of the Sierra Foothills’ best over the years. My favorites of their new wines were the Viognier, Zinfandel, and “Turnabout's Fair Play,” while I think the others hold promise but will need time to develop further. Jonathan and Susan told us that there are now around 30 wineries in the Fair Play AVA – it’s certainly been recognized as one of the prime growing locations for winegrapes in the Sierra Foothills. Cedarville has been producing fine wines there for over 15 years now, and they continue to be one of the leaders in the region. Before our trip, we’d asked Jonathan and Susan for recommendations on any newer restaurants we could try for dinner before returning to the Bay Area. They suggested Allez! in Diamond Springs, just outside of Placerville, and they were able to join us for dinner there. Allez! – yes, the exclamation point is part of the name! – is run by Christian and Jennifer Masse, who had previously been at nearby Zachary Jacques Restaurant. Their new place specializes in food to go, but it also has a small dining area, which was packed when we arrived. The food turned out to be well worth the wait, and of course we opened some terrific wines at the table too. This was another fun wine tour of the Sierra Foothills. There’s so much to discover there, and despite my annual trips to the region, I feel like I’ve only scratched the surface of what it has to offer. The model of Shake Ridge Ranch shows that high-quality fruit can be grown in the Sierra Foothills if enough care is put into the right site. But the flipside to this is that those who don’t have the expertise of the better growers or don’t spend the necessary time in the vineyard will probably not produce the same quality with their fruit, and this doesn’t help to improve the area’s reputation among wine consumers and critics. That inconsistency remains an issue in this region, as it is elsewhere as well. Over the years, I’ve seen the positive effect that attention to detail in the vineyard – and in the winery – can have on wines from the area, and the good news is that it’s is something I’ve seen more of in recent years. The quality of grape-growing and winemaking continues its slow but steady progress in the Sierra Foothills. Many of the best wines from there represent tremendous values – they would sell for a good deal more if they came from some other wine areas. 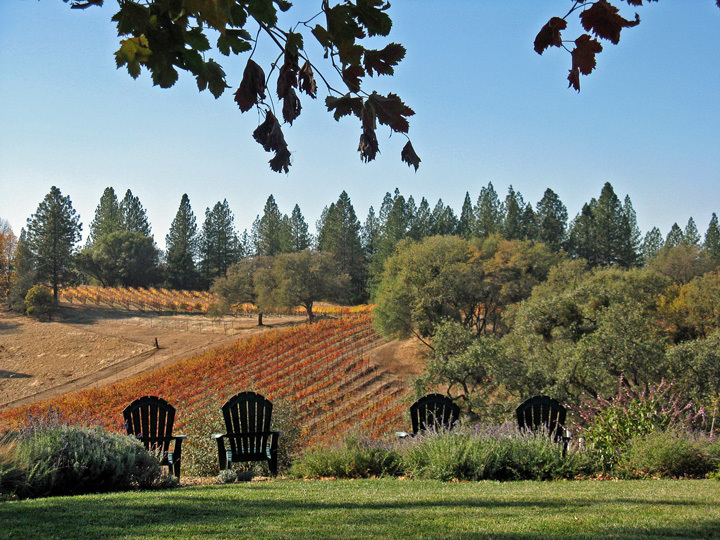 The wines of the Sierra Foothills are certainly worth seeking out and the wine region is a fascinating one to explore. As always, thanks to everyone that we visited for being so generous with their time and their wine!